Capturing the danger, creativity and occasional mad brilliance of Jim Morrison live was the equivalent of trying to hold mercury in your hands. Morrison fancied himself a poet doing penance as a singer, but more often than not, he was a drunken, narcissistic train wreck. But few people can look away from a train wreck…and no one should let Morrison’s obsession with grossing out the audience keep them away from Live’s best moments. The Doors’ “official” live album during Morrison’s brief lifetime was 1970’s Absolutely Live, which (save the opening non-Doors number, “Who Do You Love?”) absolutely sucked. 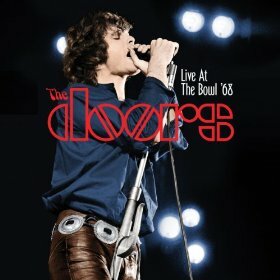 Live at the Bowl ‘68 captures the band before Morrison’s alcoholism and obscenity trials ruined the party. Drummer John Densmore’s banzai banging and Robbie Krieger’s kamikaze riffs electrify “When the Music’s Over,” on which a focused Morrison plays the role of shaman. Krieger’s boomerang guitar intros and shivering leads make “Moonlight Drive” a smooth trip and spark “Light My Fire,” despite Morrison sounding more like a lounge lizard than the lizard king. “Spanish Caravan” accentuates Morrison’s mysterious baritone and Ray Manzarek’s whirling dervish organ fills. For all the onstage intensity, there are a few songs that belong in the Bowl. Most involve Morrison’s crude, visceral poetry. “The Hill Dwellers” is the best of the lot, bolstered by Densmore’s Indian war drums and Krieger’s choppy solos. “Horse Latitudes” is horse bleep, although Krieger reigns in some interesting feedback. In “The End” Morrison delights in trying to embarrass the stage crew in to turning down the lights while spewing out sophomoric statements like “Seven people took a ride…six bachelors and their bride.” To his credit, Morrison is fully invested in turning “The End” into a nightmare set to music. Live presents Morrison at his enigmatic best — creative and controversial, but seldom boring.